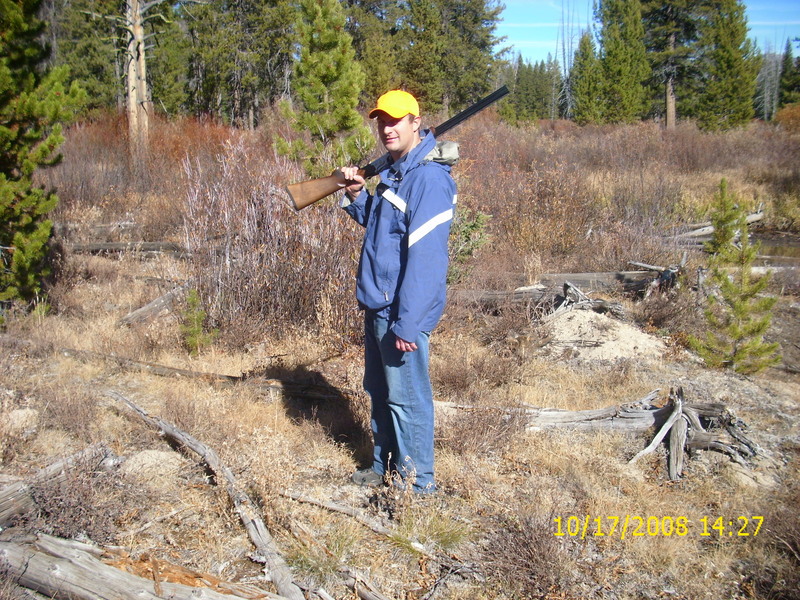 In October of 2008, Shawn and I got together for our annual weeklong hunt in the uplands of Idaho. Shawn invited our friend, Walter Bruning, to come along for the adventure. I knew Walter a little through the Upland Equations blog, but had never met him in person before this time. My friend, Walter H. Bruning, with his first sharptail from the Royal Macnab. 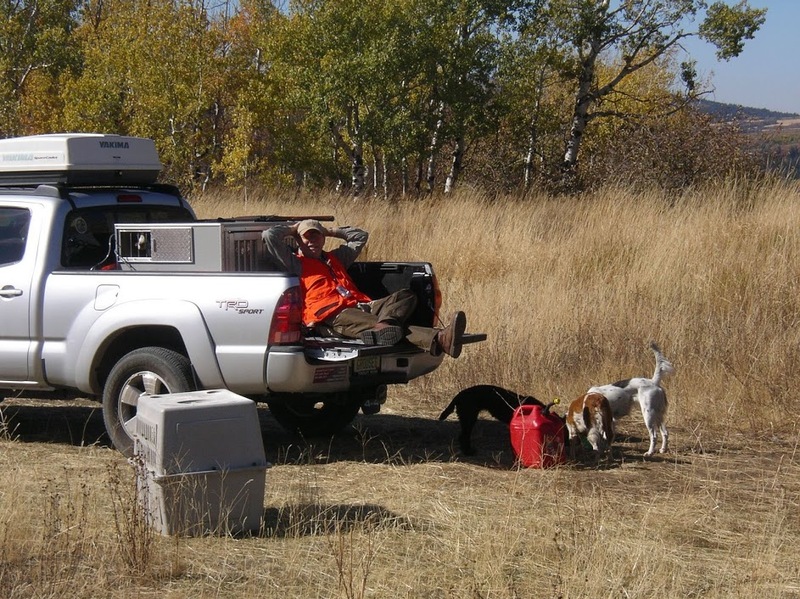 Walter had not hunted for a few years because of health issues, but with Shawn’s help, Walter found a fully trained English Pointer, “Windtuck Colorado Pride,” or “Pride” for short, and planned to hunt again that fall. During the weeks preceding our hunt, Walter expressed enthusiasm for the forthcoming hunt, but he felt some trepidation about whether he could haul his old bones up and down our hilly Idaho coverts. At the time, I was having troubles with my semi-auto 12 gauge and Shawn offered to let me use his Ruger Red Label 20 Gauge O/U for the week. Unbeknownst to me, Shawn planned to give this gun to me as he had fallen for his little AYA 20 Gauge SxS. Walter was in on the plot and picked up a box of 100 7 ½ shot shells for me. When we met up at my parents’ home in Rupert, Idaho, Shawn and Walter presented me with their gifts. I was both grateful and humbled by their generosity. I really liked Walter from the beginning. On our first day of hunting, we headed north to Sun Valley in hopes of finding some chukars and Huns in the morning and some spruce grouse in the afternoon. Our morning hunt was a bust with no birds to show for our efforts. In fact, the highlight of our morning occurred when my younger brother Robbie, who joined us for only that first day, walked out of the local gas station and declared: “I came out of that place feeling a lot lighter and it ain’t from the $1.50 I just dropped for hot chocolate!” We all laughed as we caught his drift. Robbie Wayment, our comic relief for day one of the hunt. For lunch, we stopped at our favorite taqueria in Bellevue and then headed over Galena Summit to search for spruce grouse, but again found no birds. So my dream of obtaining the Idaho Grouse Grand Slam—taking one of each of Idaho’s five species in one season—would have to wait. Unquestionably, bird numbers were down in Idaho in 2008. So for day two, we all felt we needed a different game plan. The choice was easy: The Royal Macnab, which I have written about numerous times. 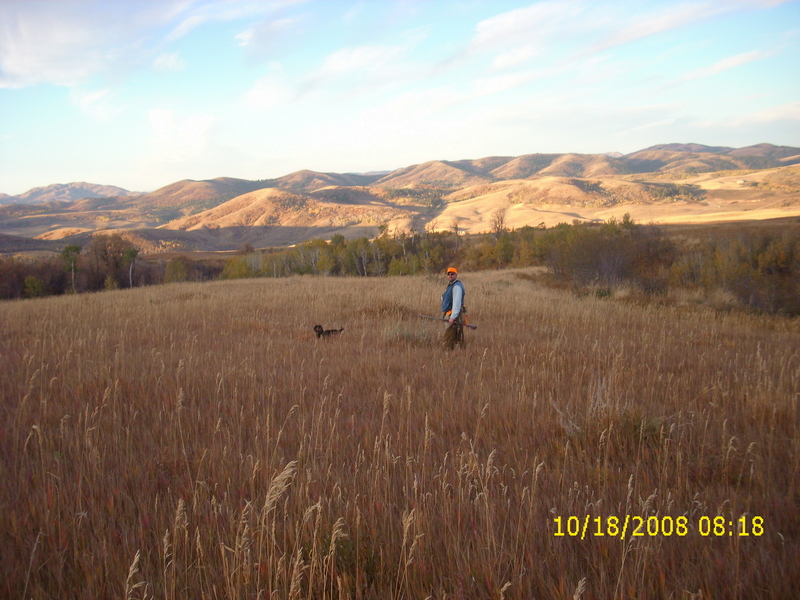 This incomparable covert is comprised primarily of CRP fields that slope gently downhill. However, through the rolling CRP fields the hand of time has gouged numerous parallel draws running east to west which have drained the area for ages. As the draws slope downhill to the west, they become increasingly deeper and wider to the point where they become more like canyons. Inside, the draws are lined with quaking aspens and numerous berry bushes, including service berry, rose hips, elder berry, and choke cherry which serve as food sources for all the game birds, including ruffed grouse, Hungarian partridge, pheasant, and most importantly, sharptail. 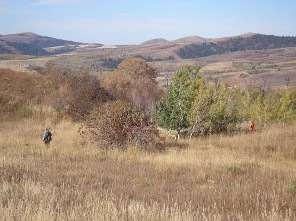 Above the CRP fields to the east are grand, steep mountains with thick pine forests. To sum it up, the surrounding panorama is simply breathtaking. We couldn’t have picked a more glorious day to hunt this locale. Walter was smitten just like us Wayments when we first experienced this wonderful place. Shawn and Ellie hunt the Royal Macnab at first light. 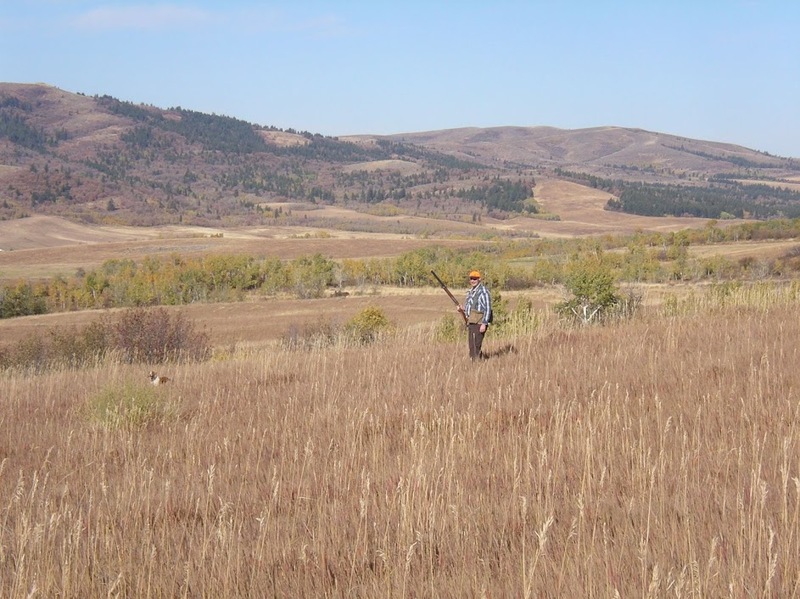 For our first hunt, we hiked toward the Pinch Point and then across the big draw and down the rolling CRP hills that have consistently held sharptails over the years. I hiked on the right-hand side near the large draw while Walter and Shawn hunted parallel to me on my left. I watched from a distance as Miss Pride locked up on point, a sharpie flushed straightaway, and Walter smoothly mounted his gun. Everything seemed to unfold in slow motion. I saw the bird fall before I heard the gun’s report. I could tell that Walter was elated by Pride’s find and his good shooting. Shawn’s Ellie soon found and flushed a bird and Shawn added a sharptail to his bag. Shortly thereafter, Walter made good on another opportunity filling his two bird limit around 10:00 a.m.
Andy and Sunny hunt the rolling CRP fields in search of sharptails. At around 10:30 a.m. we all hunted south directly toward the first small finger draw. As we passed through some choke cherry and elder berry thickets and stepped onto the grassy foot of a hill, a nice flock of sharptails flushed before me and I promptly swung my new shotgun and dropped one, but did not take a second shot. “That’s a good question. I guess I was surprised to see the first one fall.” I lamely replied as Sunny Girl made the retrieve. Due to the heat of the Indian Summer day, Walter then decided to head back to the truck for a break. Meanwhile, Shawn and I split up. I recall that I missed quite a few shots that day with my new over and under because I was unsure where it was shooting. I’m sure I felt terrible about my shooting, but time glosses over those miserable misses such that I don’t recall the specifics. Whereas, Shawn hunted a quakie thicket we call, “The Pinch” and had a wily ruffed grouse royally burn him in the thick timber. Shortly after this experience, Shawn fondly wrote: “I’ll be dreaming of the ruffed grouse that THUNDERED out of that aspen choked draw of the Royal Macnab, without offering me a shot, for years and years to come!” I chuckle because I had that same bird burn my biscuits a time or two. I report with a twinge of sadness that I finally caught up with this grudge bird in December of 2009. 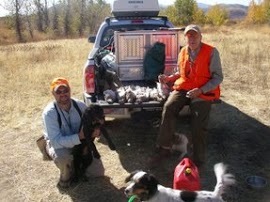 Shawn’s dogs soon found a sharptail in this same draw and Shawn finished his two bird limit for the day. With the heat of the noonday sun overhead, I hunted back up the edge of the biggest draw on the property and Sunny soon found a covey of sharptails loafing in the shade of some golden quakies. I blazed away with both barrels to no effect. At the time, I wondered—as I have so many times before—if I had blown my chances to get a limit. However, as long as the gun is loaded and there is cover between you and the truck, a hunter should never give up hope. When Sunny and I reached the top of the draw, we approached a creek bed with shoulder high grass and a solitary sharptail flushed presenting a quartering right to left shot, which is a favorite of mine. 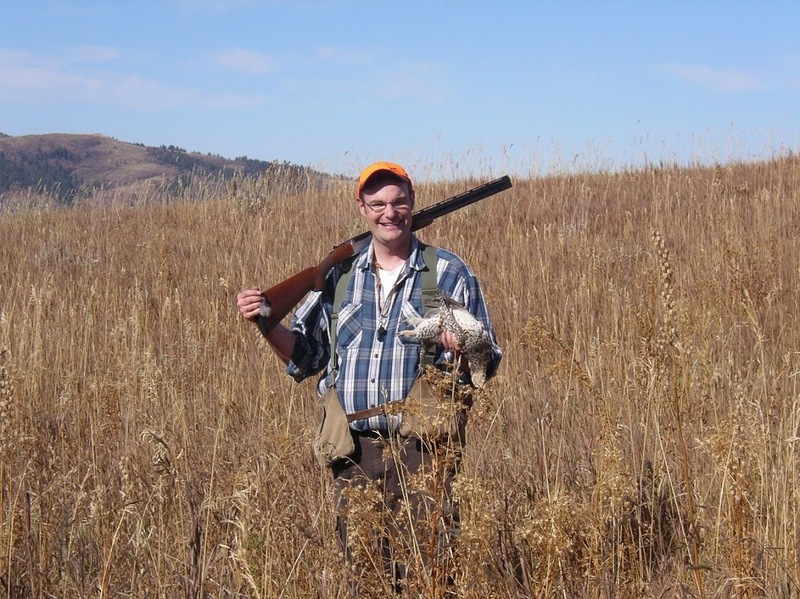 Even with the new gun, I comfortably swung through the bird with a slight lead, pulled the trigger, and the bird dropped into the tall grass. Little Sunny struggled through the grass to locate the downed bird and I ended up finding it before her. My hope had paid off. With that last shot, Shawn soon made it up to my position and we congratulated each other on filling our limits. We walked back to the truck with smiles on our faces as we discussed our good fortune. We found Walter sitting in the back of the truck soaking up the October sun, relishing the moment. I decided then to play a little trick on Walter. Walter, soaking it all in. “I love this place! I heard lots of shooting. How’d you guys do?” asked Walter eagerly. “I got my limit.” Shawn replied. “I had lots of opportunities, but I just couldn’t connect.” I responded with a look of disappointment. When I saw that Walter had bought into my fib, I then reached into my game bag and, with a big smile on my face, pulled out two grouse. “Andy, you turkey! So we all got our limits? Praise God! I’m so happy for you. Good job!” exclaimed Walter. By the time we left the Royal Macnab, I had no doubts that Walter treasured this place, this day, and our banner hunt. While we enjoyed the rest of the week hunting in Idaho, we had no other days that even came close to this special day. I’m happy to report that Walter hiked hard the whole week and held up just fine. Shawn, Ellie, Gretchen, and Walter pose with three limits of sharpies. What a banner day! 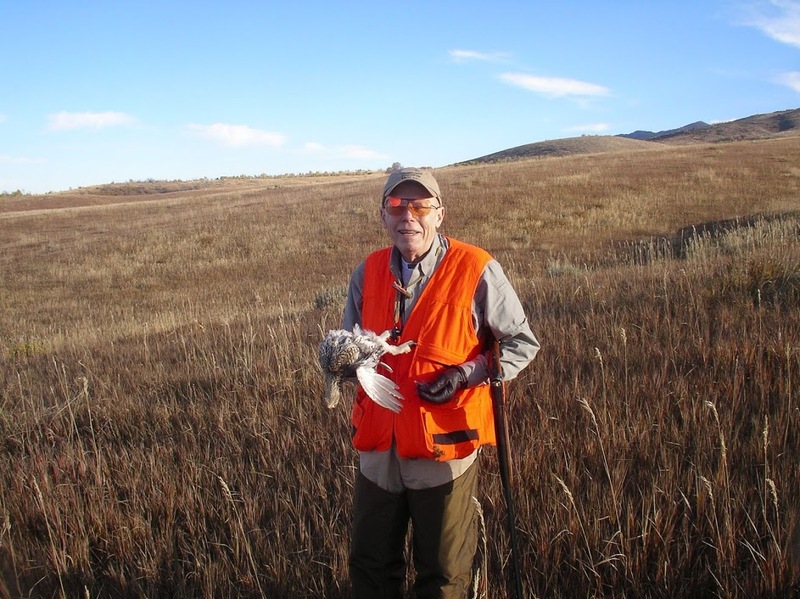 I did not realize it until recently, but this week in 2008 was Walter’s final hunt on wild birds. 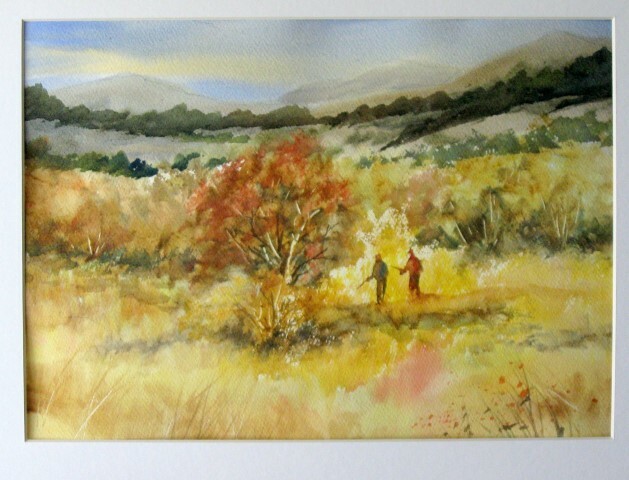 Walter now hunts with his paint brush and recreates from memory beautiful scenes from the uplands that still haunt his dreams. While I am sad that there will be no more days afield with Walter, I am glad that Shawn and I got to spend this week with him and that he got to experience firsthand the Royal Macnab. I am certain that when I reach the winter of my life and I can no longer take to the field with dogs and guns, memories of this sacred place will warm my soul. Walter and Andy work the tree line. Author’s note: Please check out Walter’s awesome paintings on his website: www.abigbrushwithnature.com. 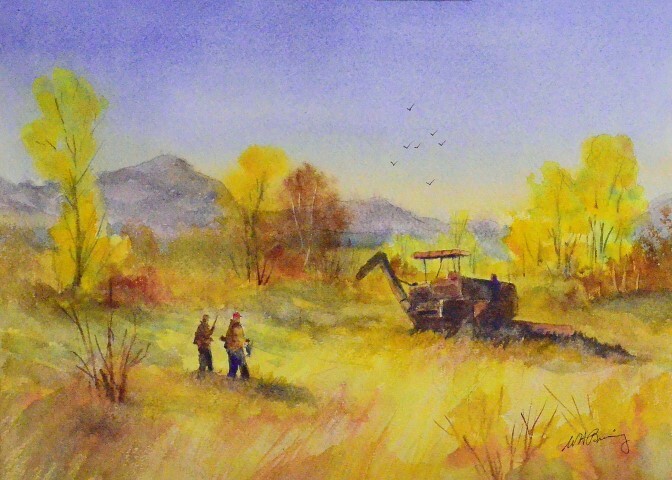 Walter’s paintings are reasonably priced and the proceeds go to a good cause. Andy, thank you. I will never forget the day or the week with you and Shawn and your family. Thanks for sharing. You sure have a way with words! I hope to hunt with you soon! Thanks Rob and Kyle. For a writer, there is no finer complement than, “you sure have a way with words.” Maybe Kyle is just trying to butter me up so I’ll take him hunting.